The Greek Committee of Byzantine Studies was founded in 1970, is run by a nine-member Council and is based in Athens. It is the official body representing Greek Byzantine science. It is one of the oldest members of the International Union and, at the same time, the strongest in terms of the number of members. It has as its object a) to promote Byzantine studies in Greece in every aspect, b) to represent Greece in the International Committee of Byzantine Studies, c) to organize the planning of Intercongrès in Greece, i.e. 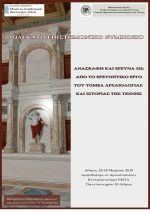 the Interim Conference between the two of major International Scientific Conferences for Byzantine Studies.